The siege and overthrowing of Constantinople opened the floodgates for the Ottoman peoples to relocate and reside in the City, as well as conquer the surrounding areas, beginning with the Peloponnese and Attiki, and eventually all of Greece. To be successful with this, however, they needed to put an end to the Venetian control over these areas; places they have had a presence in since 1204. The Venetian lands slowly, one by one began to pass into Ottoman hands, whereas by the beginning of the 17th century the Ottomans took over and occupied all the once-Venetian places. Specifically, they lost the Cycladic Islands, Cyprus, Crete (1669) and the Ionian Islands (1797). While by the end of the 17th century, the Ottomans controlled nearly all the Greek lands, the Venetians managed to regain some, such as the Peloponnese and Athens in 1687. This recovery was followed by the heavy bombardment of the Acropolis, which resulted in the destruction of a significant portion of the famed Parthenon temple. The conflict between the Ottomans and the Venetians over control of the Greek lands ended in 1699 with the signing of the Treaty of Karlowitz, where the agreement had the Venetians retain control of the Peloponnese, the island of Aegina and the city of Lefkada. The Ottomans would reign over mainland Greece and the islands of the Aegean Sea. Soon after, they took over the lands bequeathed to the Venetians as well, and thus began the long, drawn-out Ottoman occupation of all of Greece. The Ottoman occupation lasted for nearly four centuries, where the Greek people were treated like slaves by their captors. They worked as serfs on what was their land, and paid tribute to the Ottoman Empire by paying a poll tax and giving up part of the land’s crops. Among the many taxes, the one that placed the heaviest burden was the Paidomazoma, which took on the name “the blood tax”. The Ottomans, in one effort to break the Greek state of mind, would take the Greek children from a young age and trained them in military and combat tactics, converting them into janissaries (nomenclature given to Ottoman soldiers and guards). It would be same Greek boys, who years later as Ottoman janissaries, would fight against the Greeks, their own kind. Aside from the “blood tax”, other concessions forced upon the indentured Greeks included the mandatory signing of islands and islamization. Mainly because Christianity gave the Greek people courage and strength during tough times, and also helped them develop as a people, the Ottoman Empire engaged in a systematic campaign of islamization, through coercion tactics, in an effort to quash Christianity. The unequal distribution of wealth within the occupied areas resulted in the creation of three classes of society. • The highest class atop this pyramid is the aristocratic, which included the Patriarchate and the high clergy, the state elders, who held sway over large tracts of land, and the Phanariots, who were higher echelon leaders and elite who took part in managing state affairs. 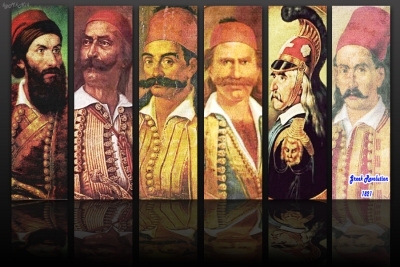 The Ottomans granted certain privileges to these groups of Greeks, in order to achieve the greatest and tightest control of the land, and commissioning to them religious and liturgical tasks, which gave them elementary powers and rights. These few privileges the Phanariots had did enable them to slowly and methodically climb the ladder of autocratic positions, which benefited the Greek people in the lower classes; both during the years of enslavement and the ensuing centuries before their liberation. Beyond the recognition of the place the Orthodox Christian Church had in Greece, the religious privileges granted to the Patriarchate gave them the status of being the head and leader of the Greek people, and the first Patriarch to take this title under the new Ottoman rules was Gennadios Scholarios. • The second class of citizens were among the traders, merchants and ship owners, a group known as the urbanites, who took a cut from the taxes and other monies extracted from the poorer class, the peasants and farmers. • By far, the largest part of the population was the third class; the poor, the peasants and the farmers, who bore the heaviest tax burden and barely made ends meet. The living conditions of the indentured Greeks, especially those of the lower class, fueled their desire for resistance, which culminated in the formation of two groups; the Kleftons and the Armatolons. The Kleftons called upon those who took refuge in the hills and mountains, and organized small, targeted ambushes and attacks against their occupiers. While the Armatolons appeared some time later, as the rival to the Kleftons early on, but later joined forces as they shared a common goal; freedom. Together these two loosely armed and organized groups led the uprising against the occupation and played an important and inspirational role for later Greeks during the War of Independence in 1821. These uprisings grew in size and frequency over the decades of the 17th and 18th centuries. They laid the foundation for the inevitable and upcoming Greek Revolutionary War. Up until 1770, countless of these ambushes and attacks took place, but they lacked in organization and adequate armaments. The first significant uprising was named after the Russian brothers Orloff, who were Philhellenes and supported the Greeks’ cause materially and in spirit. This rebellion took place during the Russo-Ottoman War, which lasted from 1770-1774. The enslaved Greeks, influenced by the Russian opposition, fought with them side-by-side and they sparked other Klefton and Armatolon groups to organize attacks and skirmishes of their own…all of this however still left the Greeks without a single victory. Nevertheless, they succeeded in getting their religious freedom and right to travel about the Mediterranean Sea, under the protection of the Russians. These new freedoms were granted under the agreements of the Kucuk-Kaynarca Treaty, which marked the end of the Russo-Ottoman War. Just four short years after the signing of that treaty, a new war broke out between the two superpowers. The second Russo-Ottoman War gave the Greek people yet new hope and opportunities to continue their struggle towards freedom. The most noteworthy rebellion was that of Suleyman against the pasha Ali, in 1789. The historical significance of this battle is the loss of 50 of Suleyman’s men, who fell off Mt. Zaloggou in 1803. The military campaign of Lambrou Katsonis in the Aegean (such as the naval battle at Andros) were effective for a time, but eventually suppressed by the Ottomans. The Greek resistance to the Ottoman occupation wasn’t limited to just armaments and battles, but was supplemented by something far stronger….a spiritual resistance. The European Enlightenment of the 17th and 18th centuries even spread to Greece. They stood to benefit from the social and economic situation from the emergence of ambitious bourgeoisie, especially from the friendly and inviting conditions of the Treaty (1774). Through their efforts, they claimed a strong footing on the Greek stage. The Greek bourgeoisie, together with Greek communities that had popped up throughout Europe as well as in Egypt and Cyprus, developed and distributed the ideas of the Enlightenment, thus creating a new effort to wake the spirit of the Greeks and provide a catalyst for the Greek Independence movement. Important figures in the Neo-Hellenic Enlightenment included Kosmas Aitolos and Rigas Velestinlis with their “Revolutionary Manifesto”, and Athanasios Psalidas and Adamantios Korais with their “Brotherly Teaching”, and other ideas of classical antiquity. This movement gained considerable strength and sustained a valiant effort, even from the Patriarchate. The war they found themselves embroiled in sadly took the lives of both Aitolos and Velestinlis. The war also resulted in a blow to the Greek culture, as the famed Parthenon was looted by British Lord Elgin in 1802, who transported the temple’s marble fresco to London, where they still sit today in the British Museum. With the influence of the Neo-Hellenic Enlightenment, amidst the fervor of revolution, the movement that promoted the idea for freedom prepared the foundation for Greece’s rebirth; it was the organization “Society of Friends” that gave people a place to gather and center around. The Society of Friends was established in 1814, by Nicholas Skoufa, Emmanuel Ksantho and Athansios Tsakalof. The first few years of activity focused on conspiring against the Ottomans, as their members used cryptic, written messages. The organization’s move to Constantinople (1818) however, helped it expand and acquire strong political support, and its central committee included the names of Alexandros Mavrokordatos and Papaflessas. Clearly, the group played a key role in the Greek’s uprising against the Ottomans, which included convening a conference. This conference decided to start an armed offensive from Moldavia and Wallachia. The position of General Commissioner went to Alexandros Ypsilantis, following John Kapodistrias’ declining, who was currently serving as Secretary of Foreign Affairs in Russia. Philhellenism was a movement that materialized in the 17th century, with ideological and political motives, whose goals included freeing the Greek people from the Ottoman occupation and unifying them into one nation. Their agenda was a moral one, but also self-benefitting. They attracted many financial supporters and sponsors who realistically helped Greece with her fight for freedom. 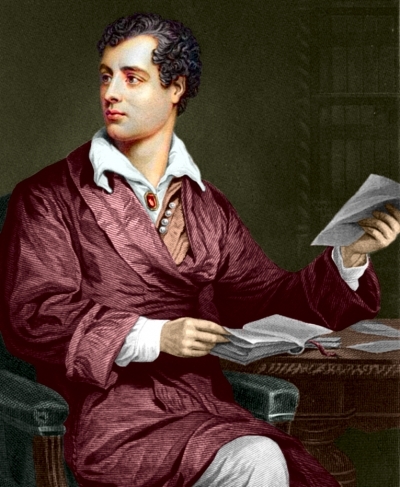 Among them was Lord Byron (England), who sacrificed his life for the cause. The Greek War of Independence unfolded during a heightened time of other movements of liberation and freedom. The revolution fermented with small attacks and ambushes at first, but nonetheless reinforced the spirit of Hellenism, which by 1821 evolved into one massive resistance movement. February 1821: Alexandros Ypsilantis, crossing the Prut River, motivated the Greek people of Moldavia and Wallachia to take part in the cause. He issued a notice in an effort to establish the “Sacred Band” of brothers in arms. The notice, entitled, “Fighting for Faith and Homeland”, was meant to instill the need for an uprising to the Greek communities. Sadly, this movement was crushed at Dragatsani, but produced the first major, organized, military effort towards liberation. March 21st, 1821: The occupation of the Kalavryta Towers—the Bishop Paleon Patron Germanos raises the banner of Greek revolution at the St. Lavra monastery. March 23rd, 1821: On that day, the Revolutionary War formally entered northern Greece, with the successful siege and occupation of Vostitsas and the liberation of Kalamata by Theodoros Kolokotroni and Petrobey Mavromihali. Just a few months later, as the struggle continued, the city of Tripoli was also freed. 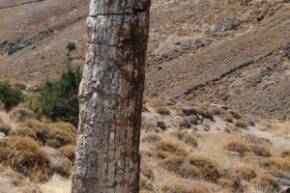 This successful trend continued into the mainland of Greece, with significant battles such as the one at Alamanas, under the leadership of Athanasios Diako, who cut off and stopped Omer Bryoni and Kiose Mehmet Pasa. 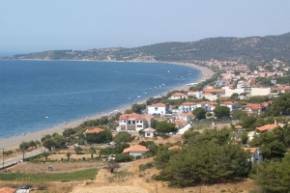 Another key battle took place at the Chani in Gravias, where the Greek forces stopped the procession of the Ottoman troops towards the Peloponnese. New, smaller attempts to reclaim occupied cities and lands popped up everywhere around Greece….due the inspiring successful battles described above. Not all of these new organized efforts triumphed however, such as the disappointing campaign in Chalkidiki. Significant victories were also found at sea, with Dimitri Papanikoli leading the Greek naval fleet. 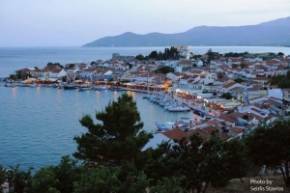 Greek liberation fighters took to ships coming from the Aegean islands, such as Hydra, Spetses and Psara. March 30th, 1822: Despite a valiant resistance, the people of Chios failed to oust their occupier and were defeated in a convincing fashion. A short while after the devastating defeat in Chios, on June 7th of the same year, Constantine Kanaris set ablaze an Ottoman naval flagship, in the straits of Tenedos island. July 26th, 1822: General Kolokotronis notched another big victory in the straits of Dramali Dervenakia. December 24th, 1822: The siege of Missolonghi by Kioutachis and Omer Vrionis begins. A week later, on December 31st, the siege ended without them sacking the city. After all that, the city fell after a second siege, which lasted from Aril 15th 1825 to Palm Sunday, April 10th, 1826. It was the Ottoman-Egyptian forces of Ibrahim that finally cracked the city’s defenses, resulting in an historic, massive exodus of the Greek residents. 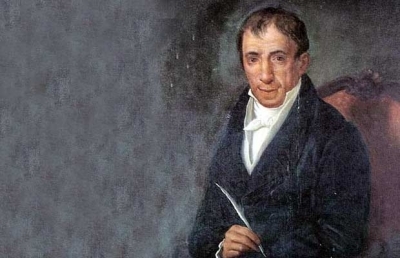 In 1823, while the Greek Revolutionary War raged on, the poet Dionysios Solomos captured, on the battle lines of the Greeks, the song of liberation called the “Anthem of Freedom”, which would later become Greece’s national anthem and set to music by Nicholas Mantsaro. Starting in 1824 and moving forward, the most trying, strenuous and challenging period of the war took its course. With the Ottomans requesting military and provisional support from their friends in Egypt, the Greeks, in some locales, were fragmenting under civil skirmishes. The ongoing political and strategic disputes between forces in the Peloponnese and the elders of the Peloponnese and islands, under Kolokotronis at first, and then under Mavrokordatos later, weakened their fighters and struck a blow their struggle. June 22nd, 1824 – Catastrophe at Psara: Advantage/Beneficiaries of the crisis that occurred within the war, the Ottomans, with the support of their Egyptian friends, annihilated the Greek forces at Psara, which was followed by the defeat at Kasos. August 29th, 1824: After the setbacks suffered at the hands of the Ottoman-Egyptian alliance, the Greek army managed to notch an important victory in the naval battle of Gerontas. This would be their last substantial win in the arena without help from abroad. From February of 1825 and on, Ibrahim, now reinforced with Egyptian support, captured the largest region of the Peloponnese, despite the strong resistance by the Greek soldiers. One bright spot was the victory in the battle at Maniaki, where only 500 Greeks defeated the Ottoman forces of three thousand. While the Greeks were able to stave off the Ottoman onslaught near Milos, they could not outlast the months-long siege in Missolonghi and, in the end, the city fell on April 10th, 1826. May 25th, 1827: This date marks the overthrowing of the Acropolis by Kioutachis, as well as the felling of mainland Greece and the death of George Karaiskaki. The revolutionary war entered a stretch where things seemed bleak for the Greek side, as they were losing one city and region after another at the hands of Ibrahim and his army. It was not until the Great Powers of Russia, France and Great Britain came to the aid of the Greeks that the tide began to turn. For the most part, the last noteworthy battle of the war took place in 1828 at Petra (Boeotia), under General Ypsilanti. The end result of the battle however was already determined. The naval clash at Navarrone, on October 20th, 1827, was instrumental in how the overall war ended. The Great Powers fought doggedly, side-by-side with their Greek friends, and wholly decimated the Ottoman-Egyptian forces once and for all. From the Great Powers’ view, one motivating factor for their intervention was the complete disregard for the terms of the London Convention by the Ottomans, signed only a few months earlier. 1823: The government of England officially recognized the Greek War of Independence, following the previous year’s repudiation at the Congress of Verona. May 1827: Adoption of the Constitution of Troezen by the Third National Assembly; that which would be a democratic-style government and political system. This new constitution included many elements from the enlightenment and philhellenism. Declared governor, by then Russian Minister of Foreign Affairs, was Ioannis Kapodistrias, who would administer over the fledgling Greek state. Preceded by a draft constitution, the preliminary charter and laws of Epidauros did not have the conditions and stipulations that met all the needs of the time. The third and final constitution also could not maintain consistency amidst the volatile climate, and was suspended soon after its adoption. July 6th, 1827: The signing of the Julian Convention in London, which officially recognized the independence of Greece. This endorsement and support came from the Great Powers of the time; Russia, France and Great Britain. This contract, which favored the Greeks, was not accepted by the Ottomans. The three Great Powers intervened on Greece’s behalf, in an effort to influence the outcome and end the war. During the time of the Revolution, Greece needed hefty financial resources and turned to accepting a loan from Great Britain. They would end up taking out two war-time loans from their friends, loans which inevitably made Greece dependent to the lending country.